McKnight has elaborated on some of his views about historical Jesus scholarship and the nature of biblical source material in a new publication, I (Still) Believe: Leading Bible Scholars Share Their Stories of Faith and Scholarship. It was not until many years later that I read Michael Fishbane’s Biblical Interpretation in Ancient Israel when he gave me the best words for what is happening in the Bible and not least in the Synoptics. There is an inner dialogue at work and once one begins to see the dialogue one sees the Bible for what it really is. It is not one self-contained text added to the previous but one text interacting with — sometimes agreeing, sometimes even disagreeing, but often expanding and adjusting and renewing — the previous texts. God’s inspiration then is at work in a history and a community as expressed by an author for a given moment. This experience of underlining the Synoptics one word and one line after another led me to think that words like “inerrancy” are inadequate descriptions of what is going in the Bible. I have for a long time preferred the word “true” or “truth.” The Bible is God’s true and living Word is far more in line with the realities of the Bible itself than the political terms that have arisen among evangelicals in the twentieth century. (2015-09-01). 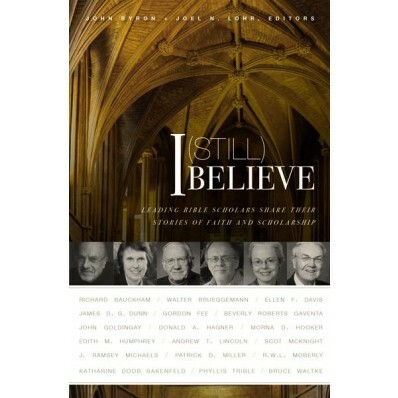 I (Still) Believe: Leading Bible Scholars Share Their Stories of Faith and Scholarship (pp. 167-168). Zondervan. Kindle Edition. So when Scot McKnight was criticizing the scholarly methods used by his peers to investigate Jesus he was not calling for them to turn their backs on fallacious “criteriology” and turn towards the methods of other professional historians (such a turn would have meant a revision in even the very questions they asked as historians) but he was, rather, declaring that historical inquiry was not capable of uncovering very much of relevance for the Church. As a Gospels specialist I entered into the historical Jesus debates, first with an invitation from Craig Evans and Bruce Chilton to sketch the teachings of Jesus in the context of his mission to Israel (A New Vision for Israel) but then even more intensively in a book called Jesus and His Death (Baylor University Press). Two things happened to me — at the deepest level of my being — through that decade of study. First, I became convinced the historical method used in historical Jesus studies yields limited conclusions. My “aha” moment was sitting at my desk realizing I can prove that Jesus died but I can never prove that he died for my sins; I can prove that Jesus asserted that he would be raised from the dead but I can never prove he rose for my justification. . . .